Exchange, SQL and IIS are at the core of most Microsoft enterprise servers. The 2007 releases of these products, along with the release of Windows Vista and Windows 2008 Server, represents the biggest overhaul of Windows enterprise products since Windows 2000. The dramatic changes to security tools and the addition of features that support "anywhere access" present IT professionals with a steep learning curve. Making certain that these products are configured to meet regulatory compliance requirements adds addtionaly complexity to day-to-day management network management. 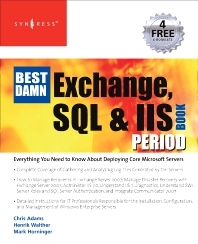 The Best Damn Exchange, SQL and IIS Book Period delivers an all-in-one reference for Windows System Administrators deploying the 2007 releases of these core Microsoft servers. The coverage is comprehensive, and provides users with just about everything they need to manage a Windows enterprise server. Special Bonus coverage includes how to gather and analyze the many log files generated by these servers. Henrik Walther is a Senior Microsoft Server Consultant working for an IT outsourcing services company in Copenhagen, Denmark. Henrik has over 10 years of experience in the industry. He specializes in migrating, implementing, and supporting Microsoft Windows Active Directory and Microsoft Exchange environments. Henrik is a Microsoft Exchange MVP (Most Valuable Professional). He runs thewww.exchange-faq.dk website and writes Exchange-related articles for both www.msexchange.org and www.outlookexchange.com. He also spends time helping his peers in the Exchange community via forums, newsgroups, and mailing lists. Mark Horninger , A+, Net+, Security+, MCSE+I, MCSD, MCAD,MCDBA, MCTS, MCITP, MCPD is President and founder of Haverford Consultants Inc.( http://www.haverford-consultants.com/ ), located in the suburbs of Philadelphia, PA. He develops custom applications and system engineering solutions, specializing primarily in Microsoft operating systems and Microsoft BackOffice products. He is also an adjunct professor at Kaplan University in the Web department. He has over 15 years of computer consulting experience and has passed 50+ Microsoft Certified Exams. During his career Mark has worked on many extensive and diverse projects including database development, application development, training, embedded systems development and Windows NT and 200x project rollout planning and implementations. Mark lives with his wife Debbie and two children in Havertown, PA. He is the author of Configuring and Troubleshooting Windows XP Professional MCSE Windows 2000 Professional Study Guide and Designing SQL Server 2000 Databases for .NET Enterprise Servers. Chris Adams is IIS Program Manager for Microsoft. Chris spends his time building and reviewing technical content for IIS, working with IIS Most Valuable Professionals (MVP), and spear-heading programs to best reach customers for the IIS team. Chris was formally a Microsoft Product Support Services (PSS) engineer, technical lead, and supportability lead for the IIS product and has deep, technical experience in the usage and functionality of IIS 4.0, 5.0, 5.1, 6.0, and 7.0. Chris is currently Microsoft certified as a MCP, MCSA, and MCSE.